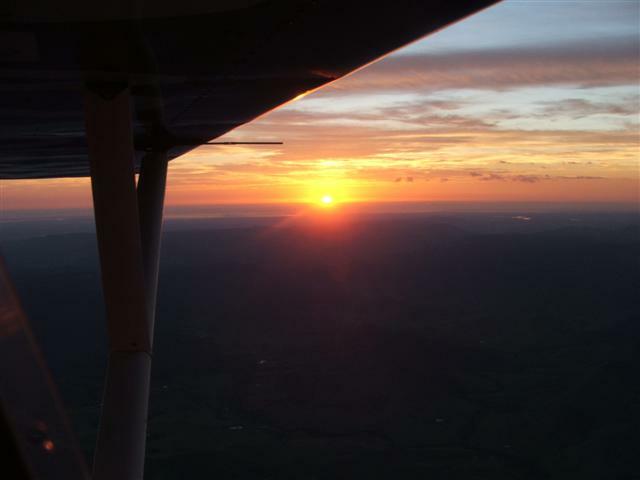 My aircraft was fuelled and pre-flighted late yesterday afternoon, and now I eagerly awaited first light at Kilcoy airfield, for my first flight of 2009. Took off at 0435 EST and climbed quickly to 4900 QNH, and was pleased to find that I had beat the sun to that altitude. Throttled back to slow cruise and waited for the earth to turn. What a memorable start to the New Year 2009! Wishing you some great flights in 2009.
ps - The ground wasn't really as dark as it shows in the sunrise photo. The camera exposed on the bright sun, making the dramatic effect.